The tag line on their website says it all, “For nearly 40 years EvanTell has existed for one purpose…to declare the Gospel clearly and simply around the world, and equip believers to do the same through resources, events, training, and mentoring.” Through December 2009, EvanTell has seen God glorified through 58,302 trainings on how to present the gospel clearly and simply and over 2.4 million gospel presentations facilitated using EvanTell training and resources. EvanTell, Inc. of Dallas, TX is plowing and pursuing all over the world. Today’s Ministry Spotlight will direct you to a ministry that will thoroughly equip you to share the gospel clearly and effectively. Clear presentation of the gospel. Careful handling of Scripture. Core doctrine of grace. These are key principles that Larry Moyer ran with when he graduated from seminary in 1973. Having overcome a speech impediment and believing God’s calling on his life, he set out to launch the ministry known today as EvanTell. Located in Dallas, TX, EvanTell exists to spread the clear gospel around the world. The vast amount of helpful resources have been used by thousands for many years. Tracts, sports equipment, wristbands, books, DVDs, training material, and much more are available to anyone, anywhere. And their training is top-notch. I know. I’ve been trained by this group to teach the practical You Can Tell It! evangelism training seminar. In fact, EvanTell has trained over 350 instructors worldwide (as of 2009). You can find an instructor nearest you by clicking here. Recently, EvanTell launched an exciting and clever way to train believers globally at no cost to the trainee. ACT111 is an interactive website suitable to train anyone, anywhere, at any time. Churches, parachurch organizations, Sunday school classes, youth groups, and many more can go through this free online training. Each individual can download his own workbook and follow the interaction in four 20-minute sessions. And each group can be signed up under its name so that group members can register under their group name. Check out www.act111.org. Groups or individuals can take this training from ACT111. One of the greatly impacting ministries of EvanTell is called Save The Mother, Save Her Child (SMSC). The goal of this endeavor is to train every staff and volunteer of pregnancy crisis centers around the country to share the clear gospel to mothers and their boyfriends and families. And they do this at NO COST to the staff and volunteers. Imagine 1.8 million opportunities to share the clear gospel in these centers in the U.S. There are online and live training available for SMSC. And if you are interested in donating to help more mothers and their families hear the gospel, you may do so here. Dr. Moyer’s method of sharing the gospel is simple. As an evangelist, myself, I have had the privilege and joy of watching hundreds of people place their faith in Jesus after I’ve just shared the Bad News/Good News with them. This is a simple method of sharing the truth about who Jesus is and what He did for us. Watch the video of the Bad News/Good News here. And here are just a few other items that EvanTell provides. EvanTell’s ToolBox. A free quarterly publication full of ideas and advice to help you share the gospel. Discipleship. Studies for new believers. Video Training. Along with live and online training, EvanTell offers video training that you can bring your whole group through. There’s so much more to tell about this organization, but I recommend you giving them a call today to find out for yourself. You can find all their contact info below. Dr. Moyer mentored me in evangelism, and his team of staff are well equipped and qualified to help you fulfill your God-given task of sharing the gospel of our Lord, clear and simple. EvanTell on Facebook and Twitter. Get the novel that is moving people to evangelistic action! 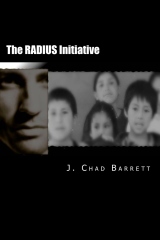 The RADIUS Initiative is on Kindle and in paperback. Thanks for sharing this info! We would love for people to stop by our website or Facebook page, or give us a call about their evangelism training needs. Keep blogging brother, I enjoy seeing you in this space. Thanks for your comment, Andy! It’s a joy to spread the good word about EvanTell! Keep up the great work there, brother!